1. Archie method for clean sands and clean carbonates. 2. Simandoux method for shaly sands. 3. 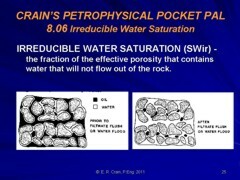 Porosity saturation product method if RW@FT is unknown or cannot be estimated from SP, R0 or Rwa methods. 4. Bulk volume water (dual water) method instead of Simandoux if it is desirable to match modern computer truck results. 5. Waxman-Smits method if good Qv and CEC data are available. 6. Resistivity ratio method as a last resort in open holes. 7. Thermal decay time (TDT) data in cases hole production monitoring situations, or where no open hole logs were run. Water saturation for complex lithology example from various models. Numerous other water saturation formula are, or have been, in use. Some are listed below and even more can be found in the literature. The ultimate universal formula has not yet been found. The most useful methods and their solutions are shown elsewhere in this Handbook. Some additional equations are shown in the table below, but you will have to solve for SW yourself.